Our unhealthy obsession with Rei Taisai at Nakamura Hachimangu in Moka continues. Though this looks to be the last installment. Until next year, of course, when we'll repeat it all over again. Let's start with the sword waving bit, OK? 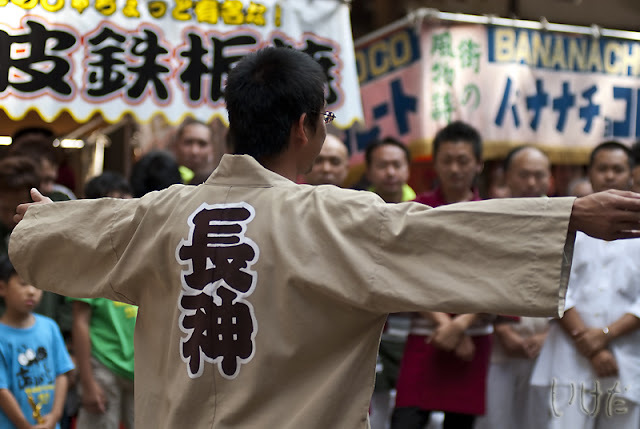 The official name of this performance is “Batto Embu Taikai (抜刀演舞大会)”. Batto (抜刀) consists of forms and techniques of katana (刀 - Japanese sword). There are numerous schools and they all have their own forms of “Batto”. 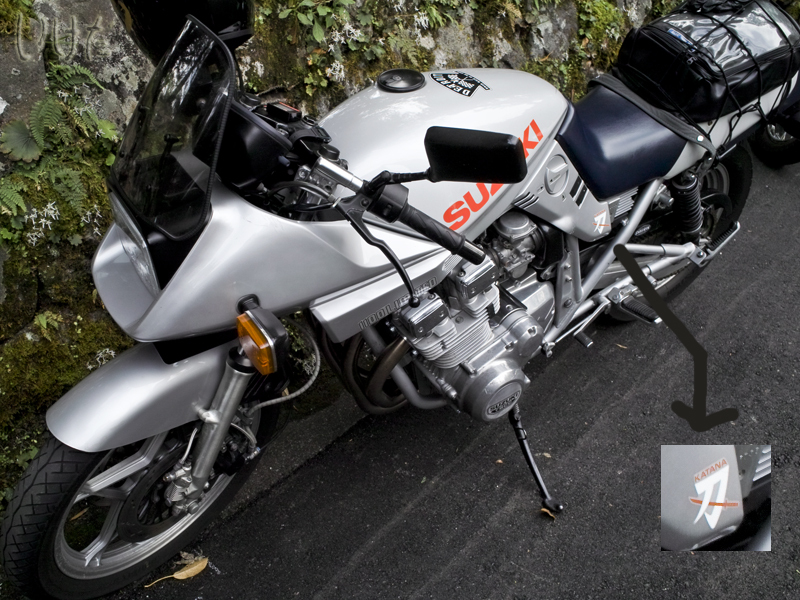 Here “Katana” does not refer to a Suzuki motorcycle, designed by Hans Muth. I love the design of this bike though. “Embu” means (dancing) performance. “Taikai” means game. I am not certain about the historical significance of sword performances at Nakamura Hachimangu. How it started, by what reasons, I don’t know, and I’m too lazy to look it up. 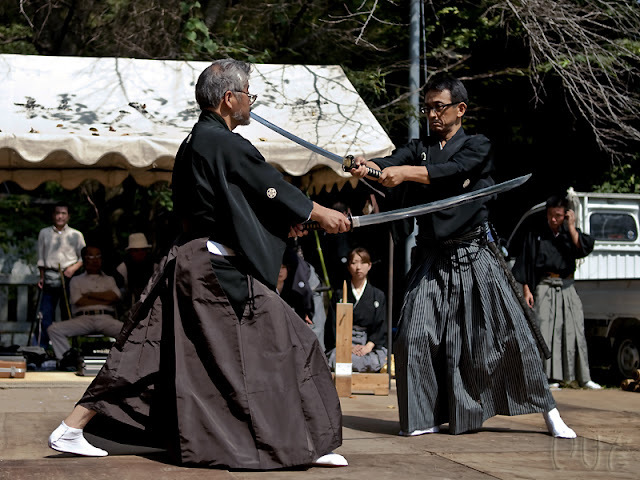 But one thing that IS certain is that the sword performance is dedicated to Hondawake deity enshrined at Nakamura Hachimangu. You can take a look at the performance by girl “samurai” here - yes, there is a video for all you fans of Japanese girls with swords! You cannot have a proper festival without a mikoshi procession!!! At Nakamura there were two mikoshi; one big one carried by mostly men, and a petite one for females. 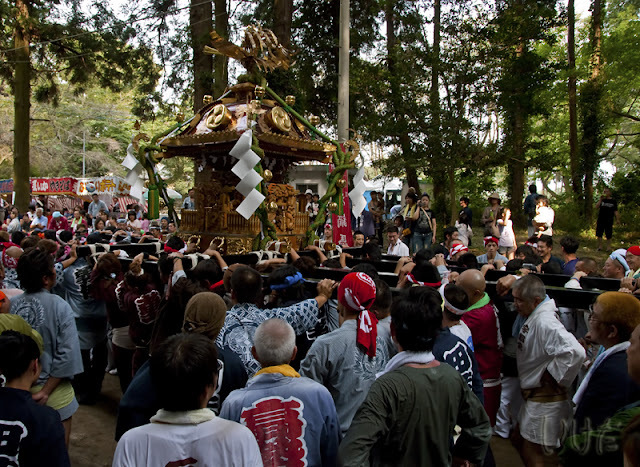 The big mikoshi was carried by individuals coming from a variety of districts in Moka, and Utsunomiya, as well. 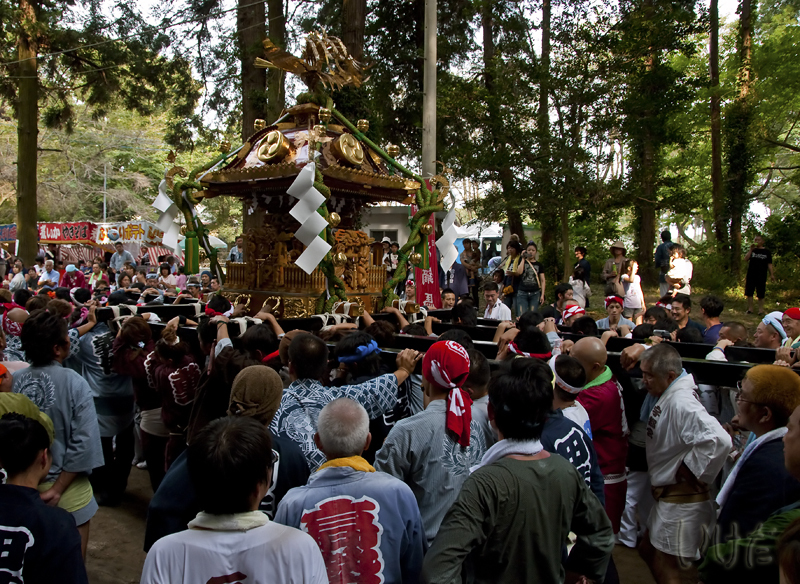 To avoid “gota" (trouble), representatives of each district were introduced to all participants of the mikoshi procession. When the name of your town was called, and if you were the chief, you stepped forward, stood in front of mikoshi, and spread your arms like scarecrow. Don’t ask me why you got to do that. Maybe to show that you were not armed. No gun or knife under your shirts. At Nakamura Hachimangu, mikoshi is paraded back and forth twice in Omotesando (表参道) that is around 250 meter long, and then the guys carry it back to the shrine. That’s fine with me, because you don’t have to follow the procession around the city. But first, for all you geeks who are into Japanese women, here's the ladies' mikoshi. Enjoy! See? Mrs Trouble has got you covered. No gota from her on this issue! And now, the boys. In the first clip you can also see the "I got no weapons" part. And part 2. 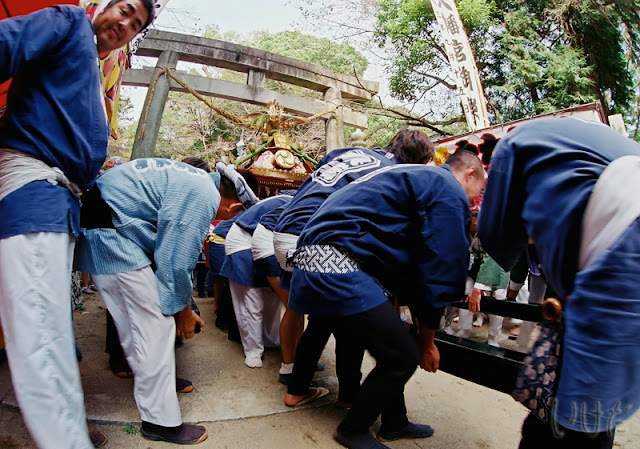 Here, the boys get ambitious and they actually JUMP with the mikoshi on their shoulders. It was quite astonishing to watch the big (men’s) mikoshi jumping along to a funny song (note that most of the mikoshi carriers are drunk), which, to the best of my knowledge, is not done in Utsunomiya, or elsewhere in Tochigi. See, Rei Taisai at Nakamura Hachimangu can make for an interesting Sunday. Oh, and one more thing to say. For those who don’t drive, Moka city offers a free bus shuttle service between the shrine and Moka station. And you'll be very pleased to hear that this post concludes our Rei Taisai at Nakamura Hachimangu series. Thank you for reading the entire “who cares about a local mikoshi festival in the middle of nowhere?” article series to the end.